The summer before senior year is known to be stressful. Pressure’s on to land an awesome internship and secure that coveted offer before heading back to school for one last hurrah. I struggled a lot to figure out what I wanted to do. Growing up, I’d always dreamed of working on Capitol Hill. I love politics — I’d spent one summer working at a political PR firm, and half a summer at a campaign that ended midway through my internship. I wanted to try something different, so I picked up the last four weeks at a real estate firm. What did I get from these jobs? Transferable skills that I can use across industries. I conducted research and analyzed data (both qualitative and quantitative); I wrote op eds and blog posts; I figured out how to navigate press relations; and I operated in high-pressure situations. But I also came away from my previous internships with this important lesson: politics probably isn’t my true calling (for that, I get my fix from The Skimm). Through these internships, I realized that I enjoyed a more business-centric environment, but still craved a way to express myself creatively. After thinking long and hard about the type of position I’d thrive in, I realized corporate communications was a great fit. I’d gained experience in political communications and could apply those skills in a corporate setting. I wanted an environment with ambitious, motivated people who have a strong team spirit. A place that cares about its employees’ interests and development; not an impersonal firm where it’s easy to get lost in the shuffle. Most of all, I wanted to gain exposure to the many aspects of business communications and be in a position to add real value to my team. I came across AlphaSights thanks to my good friend Jenny Goersch who suggested I look into their communications program. It checked off every box. AlphaSights is a high-impact, high-growth company. In the past ten years, we’ve grown from a tiny office in London to almost 500 employees across nine offices worldwide. We’re consistently ranked as one of the fastest growing UK-based companies by Virgin’s Fast Track 100. At AlphaSights, growth is both a mindset and a reality. Our week-long AlphaCamp onboarding program is packed with talks on how to retain a growth mindset, persevere regardless of failure, and maintain our day-one ambition. I quickly realized that all the qualities that initially attracted me to AlphaSights were a product of this growth mentality. These same attributes continue to positively impact my internship experience today. So, what’s it like to work at a high-growth company? As my internship comes to a close, I’ve had some time to reflect. I came in on day one ready to hit the ground running. When I arrived in the office for my first day, my trainer gave me an outline of my projects for the summer. All of them touched an area of communications and addressed a true need of the company. My internship has encompassed brand strategy, employee engagement, public relations, marketing, sales communications, social media, and project management — I’ve been able to grow my existing skill set and pinpoint areas for development. As we field new projects each week, I have the opportunity to jump in and help in any way I can. It’s been clear since my first day that I was hired and trained to act as a full-time employee. I’ve never felt like an intern. On the communications team, I’m given ideas to run with. I’m encouraged to use the hard and soft skills I’m taught by my trainer. There’s no linear path to reach an end product — I have the freedom to explore all options and determine the best path, which is at times exhilarating, yet also terrifying. I’m pushed to take ownership, oftentimes before I feel comfortable with my skills. Through these challenges, I’ve learned that I’m much more capable than I thought. Since the communications team is relatively new, I’ve always felt like an important part of the team. Due to the company’s flat organizational structure, my feedback is taken into account in the same way as the senior members of the team. I’m encouraged to contribute thoughtfully and jump in to new initiatives. If I identify a problem, I’ve learned how to come up with creative solutions and solve it myself. AlphaSights recently celebrated its ten year anniversary. Though it’s grown to be an established company, it retains several of the desirable attributes of a smaller start-up environment, just without the risk. Walking through the office, I’m greeted with smiles. Everyone is willing to get coffee and chat about their role at AlphaSights, so I’ve had the opportunity to polish my networking skills and reach out to people in different departments. If I’m grabbing breakfast in the kitchen and run into the co-CEO Max Cartellieri, he always asks how my internship is going. This kind of access to the leadership team is extremely unique, and helps everyone from top to bottom get behind the AlphaSights vision. Everything I’ve mentioned so far makes AlphaSights an awesome place to work, but really, the kitchen is what matters most to me. Just kidding! But seriously, the kitchen is a huge plus. It’s stocked with everything from kale chips to cold brew to an endless supply of gummy worms (which I’ve dipped in one too many times this summer). I’ve also joined the AlphaSights soccer team, which has been a great way for me to meet people on different segments. There’s even a yoga instructor who comes to the office every Monday, which is often the highlight of my week. It’s clear that AlphaSights invests in the employee experience, so it’s easy for people to come in motivated every day. Rainbows and butterflies aside, AlphaSights is still young and experiences growing pains. This is actually how many of our structural functions came to be. For example, with a relatively new communications team (only a year old!) and an ever-growing population, we constantly have to refine and polish our brand messaging to make sure that everyone at AlphaSights is on the same page and communicates that clearly — whether it be to candidates, clients, advisors, or even our family and friends. With so many opportunities left to take, I’ve had the unique opportunity to shape the internal and external processes that are happening in real time. And through my work, I’ve collaborated with people across the globe and delivered work that impacts every office. A colleague of mine, Cal Neikirk, noticed the lack of an LGBTQ+ social group. AlphaSights has several affinity groups, such as a Women’s Initiative Network, Charity House, and sports teams, but until now there was no group dedicated to fostering a more comfortable environment for our LGBTQ+ coworkers. Cal raised this problem to the Women’s Initiative Network, and they’ve helped us plant the seeds for a club. Even interns are encouraged to spot problems and take initiative to solve them. This fosters a culture of innovation for everyone, including those who’ve only been at AlphaSights for a few weeks. 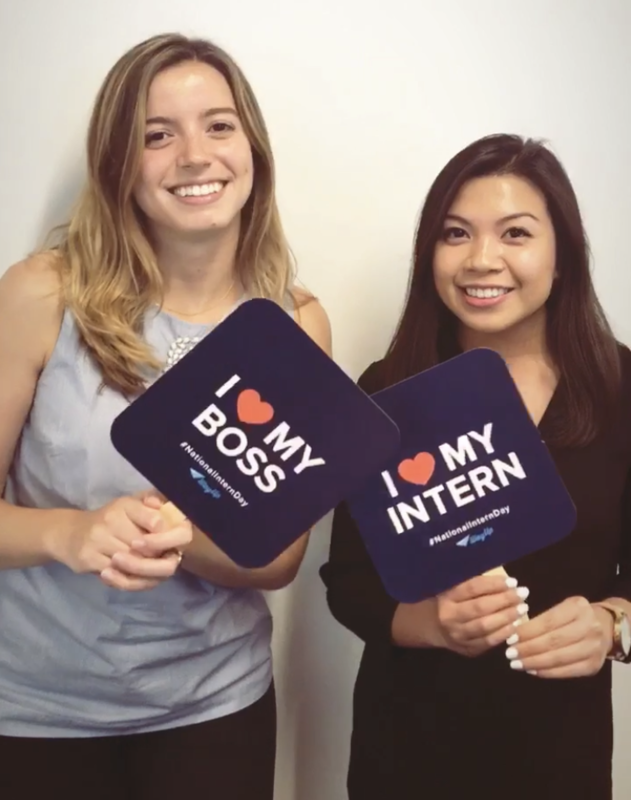 So, to everyone at AlphaSights, thanks for contributing to my awesome internship! I’ve learned more than I could have thought possible in the short ten weeks I’ve been here, and they’ve flown by. Working at a high-growth firm has its pros and cons, but in my opinion, if you’re up for the challenge, it can be an extremely rewarding experience. As I head back to Boston College, I’m so thankful to be equipped with an entirely new set of skills that I can take with me wherever I go in my career. Greer Thelander served as a summer associate on the Communications team in New York in Summer of 2018 and will return as a full-time associate in September 2019.